So, now that the buzz has kind of worn off after those historic first two games that Anthony Davis played, I think it’s time to figure out just what the hell was going on, and how he did it. He joined Michael Jordan as one of the only 2 players to have scored more than 90 points in their team’s first two games (Jordan had 91 back in 1986 and Davis has 95, if you were curious). He is still seeking that elusive first win, but it is safe to say that the Pelicans’ issues lie elsewhere than their MVP candidate. 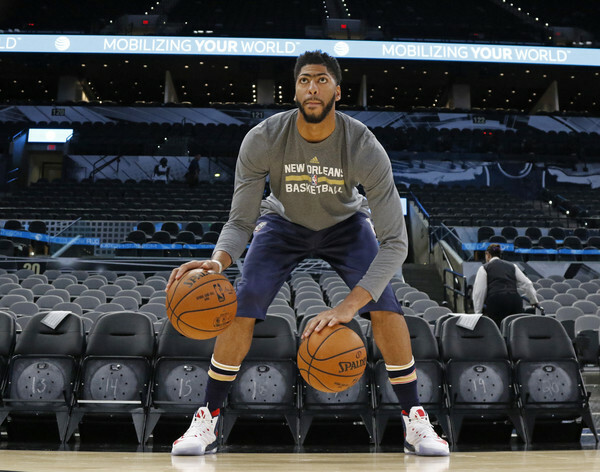 With these impressive statistics in mind, let’s take a closer look at how Anthony Davis is doing this, and what they look like in the bigger picture. Let’s start with his improved free throw numbers. For his career, Anthony Davis is averaging 6.1 free throws per game, making 4.7 of them for a 78% shooting percentage. Those aren’t bad numbers, by any means. This year, however, he is up to 15.5 free throws per game and he’s making 13 of them. Neither one of those numbers is sustainable; for context, James Harden and DeMarcus Cousins led the NBA last year with 10.2 free throws attempted per game. What is sustainable is his bump in free throw percentage, up to 84% from his career average of 78%. I have noticed a more aggressive style of play from him in these first two games, so I think it’s likely that he may start getting to the stripe more and more. For argument’s sake, let’s split the difference between his hot start numbers and his career averages and say that he averages 10.8 free throw attempts per game this year. If his 84% shooting percentage on these shots holds up, that will mean that he is getting 9 points per game just at the free throw line, which would be more than 4 points greater than his career average. That’s probably the easiest way to increase your scoring numbers, but it is not the only way that Davis has been dominating this season. The simplest explanation for his raw point totals is that he is one of the highest-usage players in the NBA right now. Among players averaging at least 30 minutes per game, Davis sits at 3rd in the league, with a 40.2% usage rate. He is sandwiched between volume scorers like Russell Westbrook, DeMar DeRozan, Damian Lillard and Boogie Cousins. This is a great example of advanced statistics backing up what your eyes are seeing, as well as common sense. When you watch a Pelicans game, it seems like their entire offense runs through Davis, which makes sense because he is far and away their best player. Getting even deeper into his usage numbers, he is averaging 98.5 touches per game, good for 4th in the league. So, with all these touches, you probably want to know exactly where he is doing his damage, right? Well, I’m glad you asked. Anthony Davis is absolutely dominating from inside the arc (40% of his points come in the paint), but you probably already knew that. In particular, he is owning the elbow. Per NBA.com, Davis is averaging 4 made field goals per game off of elbow touches, which leads the NBA. He is also shooting 88.9% on those shots from the elbow. Another way to think about it is that he is averaging about 1 point per elbow touch. When a player is dominating the way that Anthony Davis is this year, you would expect him to be leading the league or close to the top in several areas, though, and you would be right. The elbow isn’t the only place that Davis leads the league: Davis is also leading the NBA in points on post-up opportunities. He is averaging 14 points per game on post ups, and shooting 66.7% on these shots. He is 2nd in the NBA in points off of screens, averaging 6 per game on 60% shooting. He clocks in at 3rd in pick and roll possessions. He is scoring 12 points on 9 possessions per game where he acts as the roll man, for a mean 1.33 points per possession. He is shooting 62.5% in these situations. Anthony Davis is also tied for 6th in the NBA on points on hand-off plays, with 4 per game. He is shooting 100% on such shots in this young season. Davis is even getting the job done in transition, having averaged 7 points across his first two games in transition situations, which is good for 6th in the league. What I find interesting is that when you get a player of Davis’s caliber on a relatively mediocre team like the Pelicans, the common school of thought would be that he is doing this all on his own. However, 82.4% of his points this season have come via an assist from one of his teammates. It goes to show that no one does it all on their own, but there is a way to analyze the impact that having a player like Anthony Davis has on a team like the Pelicans. To do this, we need to look at another advanced statistic. A player’s Player Impact Estimate, or PIE, is an all-encompassing statistic designed to rate a player’s overall statistics compared to the entire statistics of a game they participated in. The full formula can be found here (http://stats.nba.com/help/glossary/), but the quick and dirty breakdown of this statistic is that a rating of 10% is considered to be above average. Through two games this year, Anthony Davis is clocking in at 30.9%, which leads the league among players who have averaged at least 30 minutes per game. If you are more of a fan of John Hollinger’s Player Efficiency Rating (PER) stat, you’ll be pleased to know that Davis is also leading the league in that category, posting a 42.7 in that stat. Not only do the traditional counting stats and player tracking numbers love Davis, but advanced stats confirm that he has been the most dominant player in the league thus far. So, what do all these numbers mean, you may be asking. Well, obviously, a 2 game sample size is extremely small, but it’s enough to start forming a picture of the kind of player Anthony Davis may be going forward. He is a dominant interior scorer who must be considered worthy of a double-team anywhere within the 3-point arc, but especially when he gets to the elbow. He is leading the league, or close to the lead, in almost every play-type in this space. He has also shown an increased ability to get to the free throw line, which I believe points towards a more aggressive style of play going forward. When you put all of these factors together, it becomes clear that we may be seeing the beginning of the MVP campaign that many people have predicted for Davis since he came into the league. This entry was posted in billannechino, NBA and tagged anthony davis, bill annechino, nba, new orleans pelicans, usage rate. Bookmark the permalink.